Every year, Good360 moves more than $300 million in donated goods into the hands of tens of thousands of nonprofit organizations. It’s a massive undertaking, to say the least. Operating our unique philanthropic model at this large scale would be impossible without the collaboration of our Community Redistribution Partners (CRPs). Our CRPs redistribute products donated from Good360’s corporate partners to their own network of community nonprofits and charities, usually by operating a warehouse where qualified members can pick up household and office supplies, furniture, hardware, and other items. The member nonprofits pay a small administrative fee to access these goods, allowing them to devote more of their budgets to actual programming since they’re not buying products at retail prices. These warehouses are able to accommodate 53-foot semi-trucks loaded with product and serve hundreds of nonprofits at a time. In essence, the CRPs serve as regional hubs for Good360, allowing us to vastly expand and leverage our reach across the country. A significant portion of our annual volume of donations goes through our CRP network, underscoring their vital role in our supply chain. In recent years, we’ve been focused on growing and strengthening this critical network. 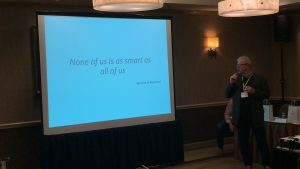 On April 11th and 12th, we hosted our annual CRP Summit and brought together 40 attendees from across 26 organizations to Alexandria, Virginia where our national headquarters is located. 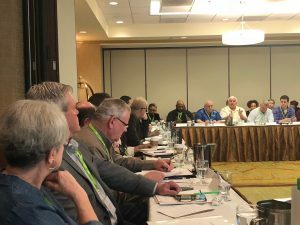 The conference gave attendees a deep dive into best practices for managing their operations and sustaining their network. 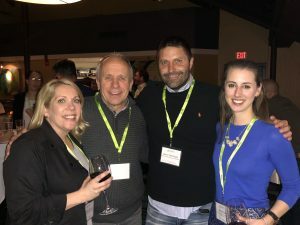 The theme of this year’s confab was “Growth for the Greater Good.” We wanted to explore some big questions of collaboration with and among the CRPs: How can we work together to increase our impact, better understand and meet the needs of our members, and deliver on our mission with greater reach and efficiency? How can we leverage the collective efforts of the network while allowing each CRP to maintain its individuality? What does a modern nonprofit look like, anyway? With those ambitious goals in mind, attendees dove into sessions on marketing and brand storytelling, tactics for network growth and engagement, program operations, product security and compliance, and disaster recovery work, among others. While our CRPs hail from all corners of the country, and vary in size and approach, they share some common challenges: how to scale up to serve more nonprofits with very limited resources; how to educate more people about product philanthropy and the benefits of using the CRPs; and how to get more of the products that their members really need. 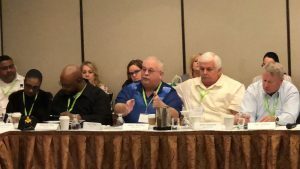 Having time at the conference to discuss these perennial challenges and share their top strategies and best practices was a huge benefit for the CRPs. Another important goal of the summit was to educate CRP members about the product donation process at Good360. A tour of our headquarters and roundtable meetings with our staff gave attendees a glimpse into how we facilitate a donation from a corporate partner and get it to an appropriate nonprofit. Often times, the people who visit the CRP warehouses haven’t heard of our organization and aren’t aware of how we redistribute product donations through the CRPs. The summit took place at a pivotal time for Good360 and the CRPs. As new channels for product donations emerge, CRPs are looking at growth opportunities as they can take delivery of more product and serve their community members with a greater variety of offerings. But with the potential for growth comes the challenge of scaling up their operations accordingly. The CRPs aren’t doing it alone, though. We have dedicated resources to helping the CRPs manage their growth, including co-sponsoring open houses, and sharing strategies for branding and email marketing. hat lasts for decades and continuously optimizes its operations to serve more and more people in need. The CRP Summit this year planted the seeds for deeper collaborative efforts that should bear fruit in the very near future. We cannot wait to grow alongside our Community Redistribution Partners and see their impact increase as well.